As Vault Dwellers scavenge and resettle the post-apocalyptic hills of West Virginia, you may be wondering if Fallout 76 crossplay is an option for your multiplayer shenanigans. In other words, can a Fallout 76 player on one platform interact with a player on another, whether it's a pair of friends teaming up or some strangers crossing paths out in the wilderness? The answer right now is no, but there's still reason for hope. Here's the most recent official word on Fallout 76 crossplay from Bethesda marketing and communications boss Pete Hines, followed by some further clarification. Both of those Tweets were sent more than a month before Fallout 76 launched and Bethesda may have made some changes internally since then. 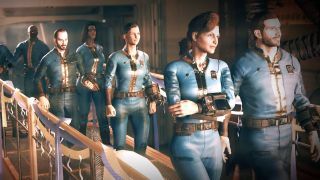 Like many of its plans for post-launch, how much Bethesda invests into making Fallout 76 crossplay happen will likely be based in large part on player feedback. If you want it to happen, let Bethesda know! Politely! Looking ahead, the fact that you have to sign into a separate Bethesda.net account on top of your PSN or Xbox Live credentials on consoles means the company is already a step ahead in making Fallout 76 crossplay happen. For instance, Fortnite uses Epic Games accounts to let players opt into cross-platform play, and Bethesda could take a similar approach. It would take much more effort on top of that, but at least Bethesda won't need to worry about going back and hooking everybody into a brand new console-agnostic system. Don't go it alone into the nuclear wastes - take our handy selection of Fallout 76 tips along with you.